Ridley Scott's original is so iconic, many of the film's most iconic sequences were already set in my mind. The cast (which, in addition to Sigourney Weaver includes John Hurt, Ian Holm, Yaphet Kotto, and Harry Dean Stanton) is uniformly stellar, bringing a lived-in feel to characters who are hardly mapped out on the page and making for a more realistic environment. The film is also smart in taking its time to set up the situation. Knowing comparatively little going in, I was surprised and delighted when the film took the time to detour to an alien planet before the claustrophobic bloodbath got started. The film highlights ethical issues (following procedure vs. saving lives, following orders vs. survival), but mostly as a chance for Weaver to yell at someone for awhile. This, too, is refreshing, as her Ripley is the type of character you wish populated more horror movies. Alien has its fair share of morons and mustache twirlers, but in Ripley, the film finds a heroine generally smart and capable enough to at least fight with people while they walk head-first into slasher film cliches. Scott's direction is excellent, and he uses the dark corners of the ship well enough to illicit genuine surprise and wonder about the Alien's physique without ever feeling like he's cheating. The production design is also excellent, giving the main ship The Nostromo a lived-in feel while creating an alien, a planetoid, and an extraterrestrial ship that each feel like their own, independent environment. Ultimately, plenty of horror movie cliches still populate the film, but its smart, confident, and innovative enough to make them shine like new. I've often heard Aliens described as the better of the first two films in the franchise, and while I'm not sure that's true, its certainly the bigger one (no surprise there, seeing as its directed by James Cameron). Where the first film is claustrophobic, like a submarine film in space, the sequel is expansive, turning its predecessor's small-scale horror into epic action. This is driven completely by sequel logic ("Oh, they thought one Alien was scary? Let's give them a ton of Aliens! "), but its done well enough to not bother me too much. The film is again well cast, with Paul Reiser, Bill Paxton, and Lance Henriksen all providing memorable turns, and the larger nature of the threat does lead to some excellent action set pieces. However, eventually it becomes clear that the film doesn't have all that many tricks up its sleeve, as the final act basically mirrors the last act of Alien, but with more explosions and a robot suit. Once again, the milieu is fairly well developed, the characters tend to pop, and the cliches are masked by a veneer of competence, yet I couldn't help but be slightly disappointed by this follow-up. Its still a solid action-horror movie, to be sure, and one I'll happily revisit. But it's less a great sequel of all-time than a film that runs on the engine of Hollywood sequel production. The film didn't need to exist except for more money to be made (shades of Weyland-Yutani in the studio system, anyone? ), and its narrative is fairly blatantly just "more is better" driven. Weaver is still stellar, as is her supporting cast, the action is good, and the idea at the film's core is a pretty great one. It's just too bad a lot of it devolves into obvious repetition. 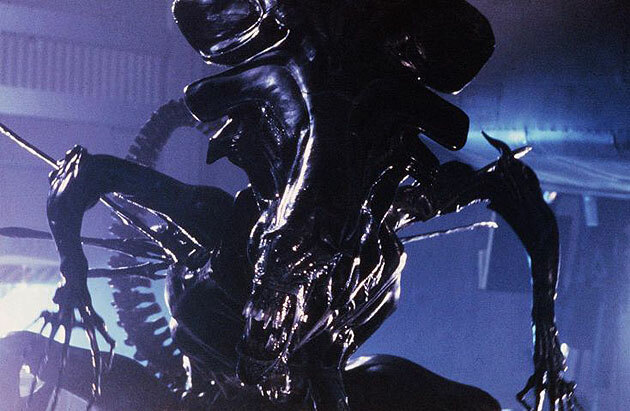 Alien3 is widely regarded as the nadir for the series, and its easy to see why. Reading a bit, the film had a really troubled production (various script edits and director shifts), and ultimately, while I can see some shades of director David Fincher's future mastery here, this seems most likely a combination of first film jitters and studio interference, leaving things a bit of a muddled mess. Where the earlier two films took their time setting up the characters and atmosphere, Alien3 seems to want to jump right to the bloodbath, beginning by killing off pretty much everyone who survived Aliens (this happens in the opening credits, so probably doesn't count as a spoiler). What proceeds is basically Ripley on a prison planet, watching various prisoners get killed off. It's all fine, and its fun to see Charles Dance (Tywin on Game of Thrones) and Paul McGann (The Eighth Doctor) in supporting roles, but Dance is the only character not played by Weaver to have any shading whatsoever, and even that is minimal. It's clear Fincher (who has since disowned the film) was going for bleak nihilism, and there's a version of this movie that could be great, but what we get here is a film that feels dark for darkness' sake, a long, drawn out march to the gory death of yet another faceless, two dimensional character. I was so disenchanted that even the film's climax, which should have been grippingly emotional (and which isn't just a clone of the end of Alien) fell mostly flat for me. I have no gripes with those who think Alien Resurrection is worse than Alien3. In some ways, I think they're right. But I definitely enjoyed Resurrection more than its immediate predecessor. Its a complete mess, obviously, full of fairly awful directorial choices and completely wooden acting. Weaver is far from her best, here, and Ron Perlman and Winona Ryder are both at their flattest. The movie is a parade of set pieces with cardboard characters thrown into them; basically, it feels a lot like a kid playing with action figures at times. However, where Alien3 pretty much completely failed to exploit its premise, Alien Resurrection is definitely ambitious, full of ideas and creative ways of tweaking the series from its base. As a die-hard Whedon fan, I may be biased, but this seems much more clearly to me a failure from a production perspective than a failure of the script. This is a pitch black comedy shot as a grim, nihilistic drama, a fun, freaky sci-fi action thriller that doesn't seem to get the tone the script is going for in execution. I'm not sure the script Whedon wrote would have made fans of the franchise happy, but it was definitely something new in the way that Aliens recast the genre and scope of the original film, and I respect that about it. It's directed like its as bleak as Alien3, and the cast seems to have no idea how to deliver the dialogue (I was reminded several times of the capable cast of The Newsroom, who can't find their way around Sorkin dialogue, or, less flatteringly, of a high school production I once saw of The Importance of Being Earnest, where everyone got the accents right but didn't seem to understand the jokes they were delivering). This leads to a movie that seems to be at war with itself. It has a ton of ideas, and little knowledge of how to execute them. It has some interesting character sketches, but actors who seem unable to fill them. And it has an ending that, while nearly identical to Alien and Aliens, finds enough of a way to tweak what is at this point the cliched final scene for the series to make it interesting and, ultimately, emotional. This is a bad movie, but its an interesting one, and something tells me I'll remember moments from this long after Alien3 has largely disappeared from my mind.